So far I have confirmed that the power supply works, the keyboard works, and local model works. The character generator seems ok, but the screen RAM is faulty (stuck bits?) and some locations on the screen will not change to the character I type when the prompt passes. This terminal was first produced in the early 1970's, so it's another one of those "glass teletypes" that can operate with a current loop or RS232 mode. Reminds me I also have a model 1500 terminal to restore as well. 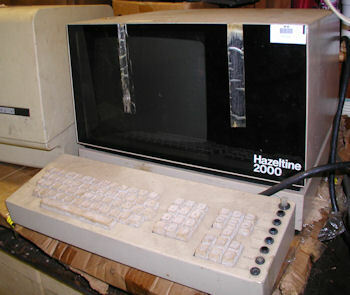 The 2000 was the first Hazletine terminal, pre-dating the 1500. Cleaned the unit top to bottom, turned out very nice except for a scratch on the terminal where the masking tape was. I was able to clear out the stuck bits in core and enter a screen full of characters without error. I was able to power off, and then upon powering on, the text was still in memory.